Jerry Priessen pointed me to an item on eBay with a beautiful Veckans SKIVA cover. As these covers are very colourful I'd love to share it with you. The seller gave wrong information about the record that is inside and that is a pity of course. The right information is to be found in my online Durium (GB) discography . Veckans SKIVA cover nr. 28: The cover is a double folder, on the front you have a generic design, the name of the artist and the titles. Inside: the right page has a nice article about different trend in dance (biguine or Tap Trot with a picture of an artist); on the left page the titles, an advertisement for the next issue, other gossips about Harold Lloyd,... On the back You have a big advertisement for the product with catalogue. All the writing is in Swedish! (Svenska). This is another DVRIVM "LA VOCE DELL' EMPERO" label I received thanks to Jerry Priessen. 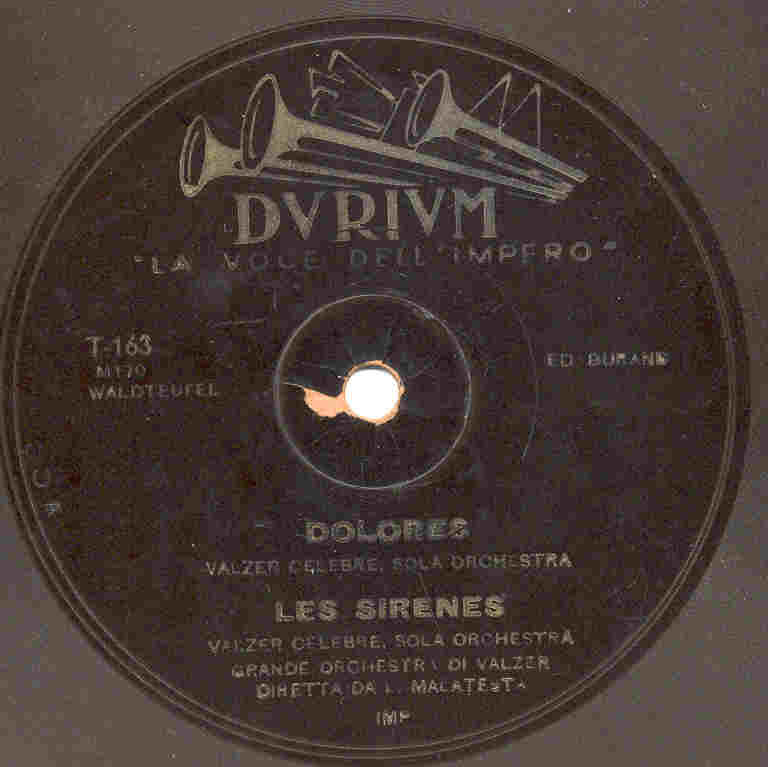 It's titles DOLORES and LES SIRENES both played by the GRANDE ORCHESTRE DI VALZER DIRETTA DA L. MALATESTA. This record is part of a series, apparently made by the same band, also named DURIUMS VALSORKESTER I MILANO or something like that. The recordings of this band were released on ABC, a French record label released, probably by SEFONO and on SUPER durium ( in the BD-series). It is strange that the label reads IMP wich suggests that the recording probably wasn't made in Italy, but in (Slough near) London. It would be nice to see a label scan of ABC 6062 to compare with. If someone can show me a scan of this ABC 6062 that would be great. Nice to tell you that someone took a pair of siccors and cut from my copy the first tune, probably because it was damaged (or maybe a child wanted to suggest is was a EP or single record.) On the reverse some drawings by pencil of trees and houses made by child. The online Durium (GB) Disco project is part of a large project to share the complete Hit of the week - Durium Discographies with all cardboard Durium record collectors. Up to now the Hit of the weeks (1000-series), the Durium Advertisement and Custom Records ( 5000-series) released in the US and the commercial English Durium records (E-1000 up to E-1131), made in Slough ( near London) are now to be found at http://durium.opweb.nl, the sites to search for information. A new page.is now available. It lists the durium matrices E-1115 up to E-1131. These were the last commercial made recordings for the Durium Products (GB) Ltd. before it broke, due to failing sales figures. The firm activities were limited to advertisement and custom records and renamed Sound Distributors. It seems that a kind of temporary firm took over Duriums contracts still in force under the name of Dubrico Limited. Matrices E-1124 up to E-1131 are recordings made for the Scandinavian market and labeled as SUPER durium and released in Veckans SKIVA jackets. An English band, Sydney Kytes Piccadilly Hotel Band accompanies two Scandinavian singers, Toivo Ek and Herbert Landgren. It was cheaper to bring those two singers to London, then recording the tunes in Stockholm or Copenhagen, I guess. A year later the Scandinavian records were made in Copenhagen by Nordisk. If you have images of labels or singers that should be on this page to illustrate, please let me know.